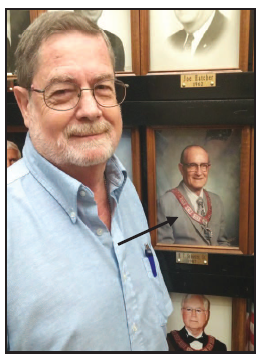 H. T. (Tim) Schuster JR.
Past Grand Masters Frank Ford, Derrell Hollingsworth, and Tim Schuster Jr. I personally want to thank the members of the Grand Lodge of Texas for giving me the opportunity to serve our great Order this past year as Grand Master. I have attended the Executive, W. & O. Homes, and Grand Lodge Board of Trustees monthly meetings, some of the Event Center Management Committee meetings, and the General Arrangements Committee meetings for the Grand Lodge. I would like to thank the members and lodges that made the movie theater possible at the Retirement Center. I attended this year’s Grand Junior Lodge and Theta Rho Assembly Sessions, the Tex-N-Youth Association, the Ex-Students’ Association banquet, the annual picnic, and the Mid-South Conclave. I attended the Rebekah Assembly President’s Tea honoring Donna Weeks. I attended the official visit of the Rebekah President, Donna Weeks, to the Amarillo Lodges. I also had the honor to attend a banquet in my honor given by the Amarillo Lodges. We had 60 members of our Order present and everyone attended the play “Texas” in Palo Duro Canyon. I had a special meeting about the Retirement Home and the Nursing Home, and met on our finances of Grand Lodge with the major committees. I went to the Pilgrimage at the Retirement Home that Donna Weeks, President of the Rebekah Assembly, and I hosted. We had the members of Grand Junior Lodge and Theta Rho Assembly give a program. I attended the Department Council and Grand Encampment Sessions. 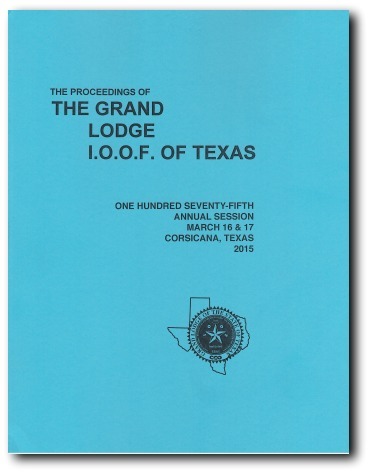 I had the pleasure of attending the 160th Anniversary celebration party of Dallas Lodge No. 44. Assembly President Donna Weeks and I hosted the Christmas party at the Nursing Home. We had the help of the youth and Mr. and Mrs. Santa Clause and Elves. I want to thank all who donated to help make this party a big success. I also attended the Grand Warden and Assembly Warden’s Christmas party at the Grand Lodge office. The Event Center invited me to their Christmas lunch and I was happy to attend. I had the honor of attending the Laying of the Wreath at the Tomb of the Unknown Soldier in Arlington National Cemetery in Washington, D.C. Assembly President Donna Weeks and I laid the wreath. I attended the Corsicana Degree Rally. There were fifteen new members brought into our Order that day. I have visited a lot of Odd Fellow and Rebekah lodges this year. I had great fellowship with them, listening to their concerns about our great Order, and helping the weak lodges grow. The Retirement Home was temporarily closed. The Grand Lodge will make a decision at Grand Lodge this year as to the future of the Retirement Home. I hope it will reopen. We need it for our elderly members. I have done a lot of traveling this year. I have traveled over 36,000 miles this year promoting Odd Fellowship. I would like to thank the Grand Lodge Office staff for helping me out this year. They went way beyond their duties for me. Thank you all.